Dual Purpose Rooms’ Make Spaces Work Harder! Home|Blog|Uncategorized|Dual Purpose Rooms’ Make Spaces Work Harder! Many homeowners are taking a second look at innovative ways to create dual purpose rooms in their log homes. Combining a guest room with an office, a craft or sewing room, or children’s playroom can make sense if the project is approached with an eye for detail. One fantastic way to create dual purpose areas —and utilize bits of space that are left unused in many designs is to install built-ins. Besides adding permanent value to your home, built-ins can provide additional storage options, places to fold away home office desks, crafting supplies, and even a wall bed, creating a clean open area ready for a second use. 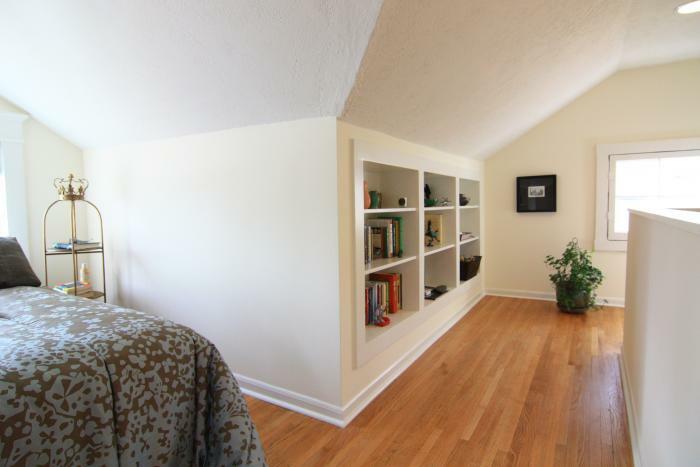 Built-ins don’t need to be elaborate to be effective. Simple options for the area beneath a staircase include built-in storage drawers or cabinets, a series of cabinets to hold pet supplies, coats and boots, or games and toys storage. The under stairs area can also make a surprisingly roomy and efficient home office or school study area that is adjacent to other main rooms, yet tucked away. On the second floor, kneewall cabinets fitted with doors and shelves or drawers can provide expanded storage. 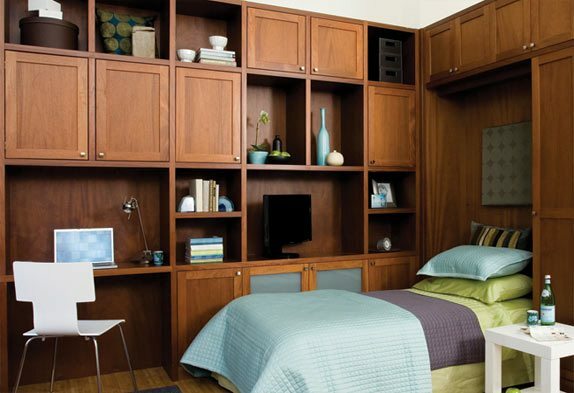 Building platform beds in smaller bedrooms can create tremendous out-of-the-way storage that maximizes smaller areas. Rooms with little cubbies and interesting bed set-ups can prove to be very appealing for kids of all ages. 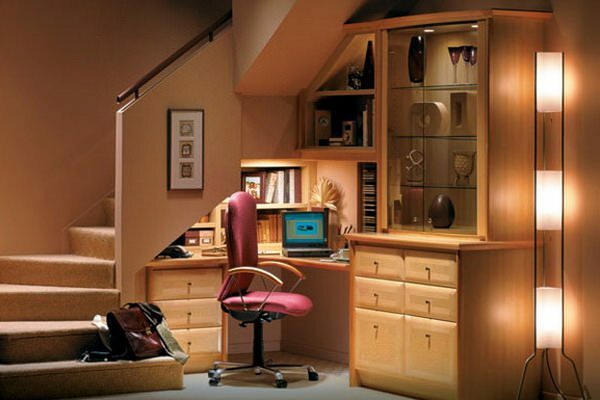 For adults, using a room as a home office/guest room is a common set up. With built-ins, an office can be set up with a desk, file drawers and accommodations for computers, printers, cords and telephones that can be closed up into the wall. Some wall or “Murphy” bed companies offer custom cabinetry that includes a bed that drops down on cantilevered springs to create the bedroom along with an office, craft or entertainment center built-in. These wall beds provide a much more comfortable sleeping experience as they support full mattresses, rather than the thinly-padded sofa sleeper pull out. As one wise woman noted, “there are eight corners to a room.” In other words, don’t rule out going up with storage ideas that can keep floor space open and make a smaller room function as a bigger area. Adding cabinets or shelves on the upper third of a wall can offer storage and convenience for supplies, toys, craft supplies or out of season clothing. Keep the storage units attractive and functional and they will create a decorative look for the room. Many storage container companies offer basket and shelving options that can create a cozy atmosphere. Many families are adding in-law or small apartments to accommodate moms and dads, nannies, or other caregivers. Creating efficient built-ins and arrangements with pull down or platform beds can offer a spacious feel to smaller spaces located over garages or in third floor loft areas. One nifty treatment for an in-law space is the under stairway kitchenette. A small refrigerator, a cooktop, some counter space, and a small sink can create an area to allow some independence and privacy away from family activities. 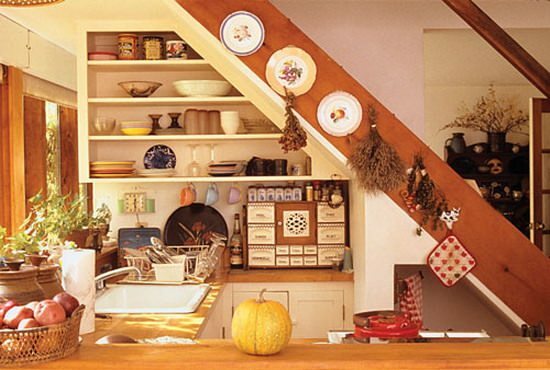 Arrange elements beneath the stairs from tallest to smallest making sure prep and cooking areas have enough headroom.